Stage fright can seriously affect players and can put a stop to a student or professional career. More and more, people tend to resort to drugs but is this the only option? Do they address the causes of stage fright? 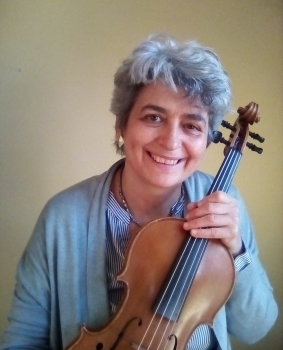 There is a book, Stage fright by Kató Havas, that is focused on this aspect, a serious problem that many players and most violin & viola players experience, offering effective solutions. Now everybody talks about this and many have been written with these words in their titles, but Kató Havas's book Stage Fright was the first and original book ever written on this! Published in 1973, is based on her experience of the application, for about fifteen years (then), of the New Approach in teaching. By teaching the New Approach, Kato Havas realised that the elimination of physical tensions made playing easier and this in turn reduced the emotional tension, eliminated stage fright, the nerves connected with performing for an audience. What's written in Kató Havas books can be applied to both violin and viola playing. - videos of Kató Havas workshop, 2008. By studying them in chronological order you'll notice some slight differences. As Kató Havas herself says in Stage fright, these changes in the terms used and in the indications, based on teaching experience, became necessary in order to simplify more and more, eliminate those terms, exercises, movements that cause physical and mental tensions. Therefore each book/video is a more in-depth explanation of the previous ones, so it's highly advisable to read in this website the pages about the various books, then read all the books, watch the teaching DVD and the workshop videos available with subtitles. If you have doubts on how to resolve various problems and so far you haven't found answers, I warmly recommend them to you! Playing an instrument is not just a matter of moving the fingers, it has to do with character, the essence of the person. Stage fright can come from other serious situations of life that cause the player to lose his/her confidence in his ability to control situations, therefore the player loses confidence in his ability to control the movements necessary to playing. There are many who play very well, despite a lot of tensions, pain and aches and nerves. What a price to pay! Besides this, if one relies only on fingers' mechanical movement, everything may go to pieces when external factors, having nothing to do with music, interfere and a shake a person's confidence. I'm very grateful to Kato Havas for what she taught me and for the help she gave me to get to play with real joy. This book too received a very positive comment from Yehudi Menuhin. The book examines in detail the causes of all the fears most of players have, giving practical solutions to them. These are the chapters, for each fear causes and cures are explained.